The James Herbert Wetland Preserve is a little piece of Tulare County tucked in between dairies on the Tulare-Lindsay Highway. But at more than 700 acres, Herbert isn't tiny at all, and it packs a major ecological punch, as one of the last areas of wetland prairie in the area. SRT purchased the site in 2000, and been working to restore the site ever since. We’ve created an 83-acre seasonal wetland with meandering stream channels and native vegetation, enhancing the area for wildlife. more than 125 bird species seek food or shelter here, including burrowing owl, Swainson's hawk, red-winged blackbird, mallard and golden eagle. The fragility of the ecosystem means SRT doesn't normally open Herbert to the public, but last year we did a spring hike there and it was so fun, we decided to do it again. 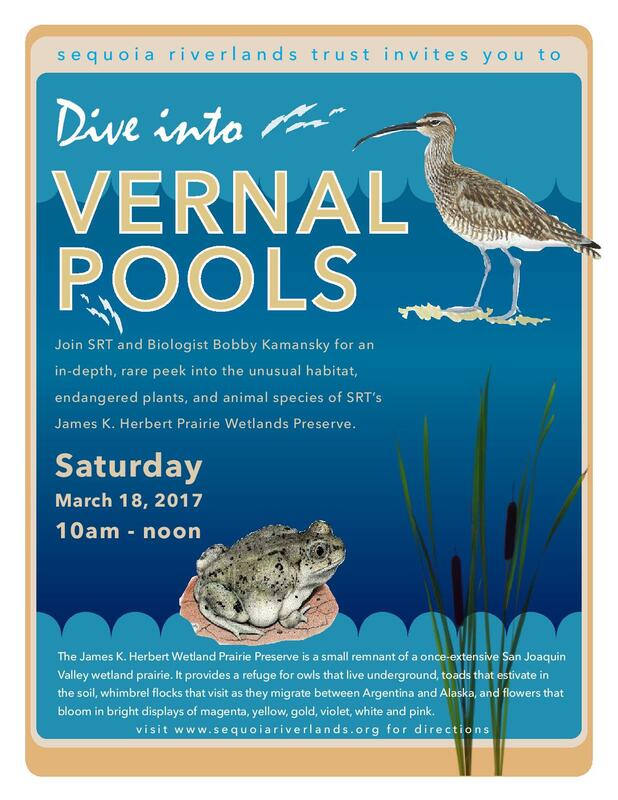 So mark your calendar for Saturday, March 18 from 10 a.m. until noon for the second annual Vernal Pools walk at Herbert. Vernal pools, shallow depressions where small ponds form during the rainy season, appear above an impermeable soil layer, like hardpan or heavy clay. In spring, wildflowers bloom in brilliant circles forming a floral kaleidoscope around the pools. Our guide for the walk will be local ecologist Bobby Kamansky, who has worked with SRT on Herbert's restoration. He'll give us an in-depth and rare look into the unusual plants and animals that call Herbert home, as well as the many migrating birds who stop at the vernal pools. Cost for the walk is $10 for SRT members, $15 for nonmembers; students can attend for $5 and anyone under 12 can attend for free. This winter's rains should mean a spectacular wildflower display and the vernal pools are already forming, so come out and see a landscape you don't see every day. The land is very flat here so it's an easy walk, too. Don't forget to bring your camera! We'll start at 10 a.m. and end about noon. Herbert Preserve is located on the south side of Highway 137 just before Road 168, about 5 miles east of Highway 99.